Will a New Office Enhance Your Company's Culture? The implication is that office design can change and enhance company culture. According to Max Chopovsky, founder of Chicago Creative Space, it’s just the opposite: culture drives office space. “For a company to be successful, you have to start with a founder who is passionate—one person who can galvanize a group of people to believe in an incredibly clear vision,” he said. Next comes a strong set of values that extend from that vision, and they must be communicated clearly and concisely to employees. CCS is a web-based video production company that showcases some of Chicago’s young companies and their office spaces. Chopovsky is a real estate broker by trade; he’d observed the connection between culture and space, and wanted to use his talents as a videographer to help others understand the connection. “We are at the crossroads of real estate, tech, design, and media,” he said. His intentions with Chicago Creative Space are threefold. The videos make great recruiting tools for the companies that CCS profiles, they highlight Chicago as a great place to work, and they are a source of inspiration and information for startups looking at their first office space. And in the age of remote working and changing demographics, he said, the role of the office must change. And as for the trends he sees from his perspective of office connoisseur? 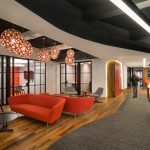 He cited Red Frog’s zip-line, Braintree’s hammocks, and Tribeca Flashpoint’s recording studio as examples of various in-office amenities that match each company’s unique culture.